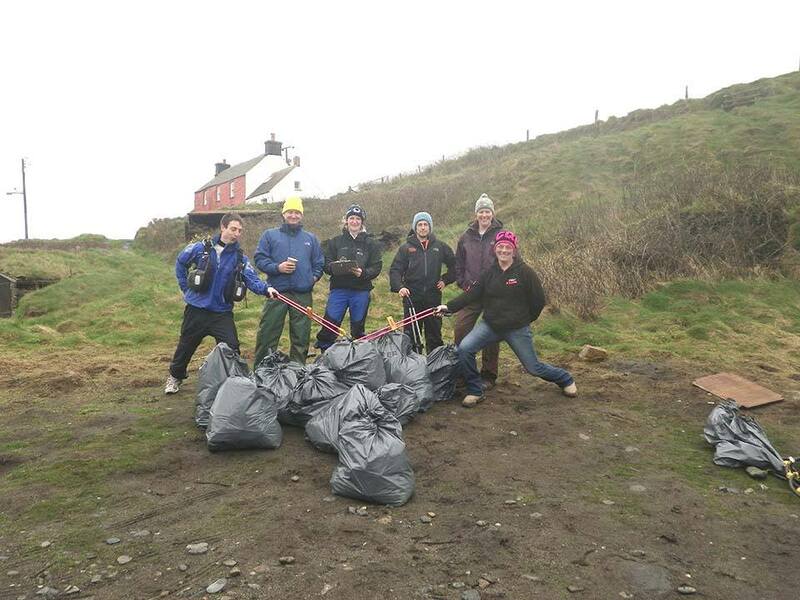 Abereiddy gets a Spring clean, let’s make Pembrokeshire sparkle! After all the storms this winter, it was time to try to get the sparkle back! It was misty with an added bit of murk and not to mention a breeze too…but that didn’t stop us from taking on the Pembrokeshire coast! The team at Celtic Quest Coasteering, Board Games Surfing and Kayak-King were all set for a different adventure 🙂 Abereiddy Beach needed some cleaning and nothing was going to stop us! The National Trust and Pembrokeshire Coast National Park Authority were on hand to offer up their gloves and help manoeuvre some rubbish in their truck, it was great to have them with us! They used their muscle to drag a huge bag of rope and fishing line from the Blue Lagoon that the guides from Celtic Quest Coasteering have been filling up over the last few weeks. The winds had blown a lot of it away from the beach and up the valley, but with our army of volunteers it was soon looking squeaky clean. With 41 people giving us a hand it made it feel like lighter work! The drizzle made it that little bit harder. Trying record statistics of what we found for the MCS was, well…tricky and more like paper mache! But rubbish was collected, tallied and the majority you ask? Huge amounts of tiny pieces of polystyrene, fishing line, bits of fishing nets and the standard crisp/chocolate packaging! While rummaging for litter on the rocky shore we also found lots of mermaids purses washed up after all the storms, these are egg cases for sea creatures such as sharks, dogfish and rays which the Shark trust are keeping records of (check out their website for all the info!). So all in all a fantastic time had by everyone, the sun even came out as we finished which we think may have been a thank you from mother nature! A MASSIVE thank you goes to: all the volunteers that came out in the mist for some Pembrokeshire cleaning, Keep Wales Tidy for providing us with some little pickers and bag hoops, Pembrokeshire County Council for providing lots of strong bags and offering to pick them all up once we had filled them, Cool Selection for parking their refreshment van up and providing everything we needed, including many ice creams annnnd everyone else that was involved! Abereiddy is now looking great and ready for an amazing Welsh Summer season to hit….the car park may be slightly smaller but nature always wins…and in its own right it is a beautiful place to come and play!